Tie pins are available in a variety of designs and colours, so there is no excuse for not being able to find one that fits your personal style! Let us guide you through our vast selection of these subtle yet practical fashion accessories. A well-dressed man likes to show the world his good taste, which includes carefully selected accessories to add that special touch. A beautiful suit with a colour coordinated pocket square, and beautiful tie can greatly benefit from a little detail such as a sharp looking tie-pin. There are only a few reasons why you should complement your tie with a tie clip. But they are very convincing ones. A tie-pin can hold your tie into a position that lets it stand up a little. It can also make certain that your tie will not dip into your soup. They are a must on windy days and prevent that blown away look. All and all, for a small item, they are quite practical to wear. Where should my tie-pin be placed on my tie? Men may be tempted to wear their tie-pins very low down to keep the tie out of their food; if that is the case they should opt instead for a bib, because a tie-pin just looks silly when it is worn so low. The correct fashion style dictates otherwise. Please refer to the drawing below where you can see the proper location for the tie-pin is in the middle of the breast pocket or in between the 3rd and 4th buttons of the shirt. Tie-pin in silver or gold? Unlike gold or silver earrings that are constantly in touch with your skin, there really are no health concerns in the wearing of tie-pins. Of course gold and silver are popular precious metals so we have made a carefully tasteful selection of sterling silver pieces from the Danish Nordahl Anderson designer collection. What is the proper tie-pin width? Tie-pins are small and should never be wider than the actual tie it is holding in place. 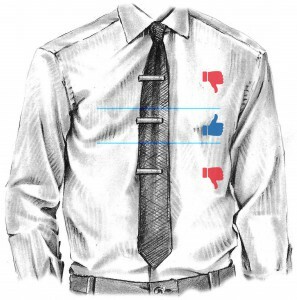 A good rule of thumb is that they do not surpass three quarters of the tie's width. The illustration below shows you the difference it makes. 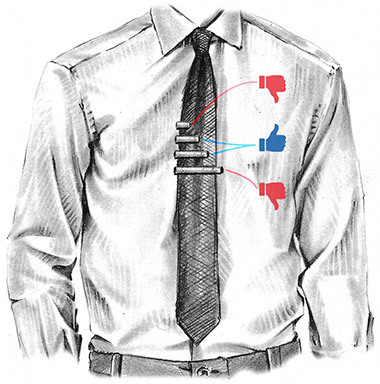 Tie-pins have two ways of locking your tie into place on your shirt: a crocodile clip or a slide-on clip. Its always preferable to wear matching accessories so, for example, if your wrist watch has a silver-coloured casing both your tie-pin and cufflinks should also be predominantly silver. Crocodile clips are made to stay in place but you should consider a slip on tie-pin for more expensive ties.